Over a decade ago, I visited Giants Causeway in Ireland and I was amazed with the thousands of hexagonal shapes that formed. 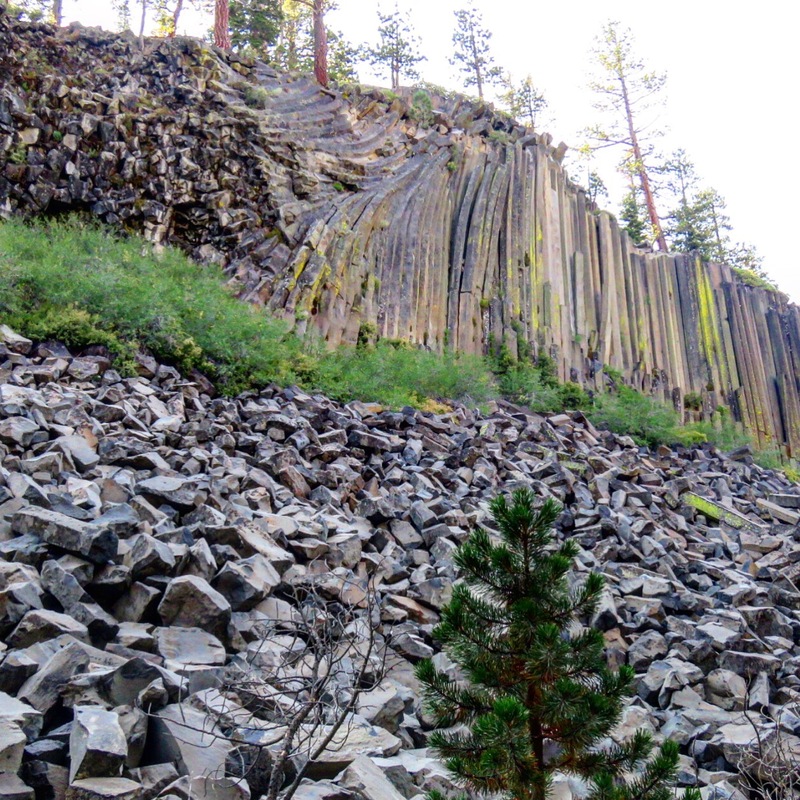 I was so intrigued that I researched similar areas and found Devils Postpile in Mammoth Lakes, California. 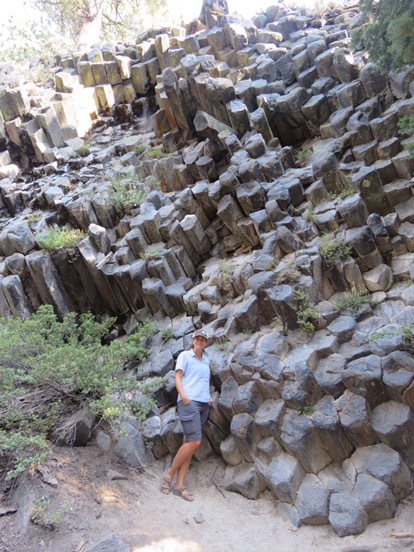 The monument features thousands of hexagonal basalt columns formed 100,000 years ago when a lava flow slowed and then cooled and cracked. It immediately went on my bucket list and yesterday I was finally able to cross it off. Leaving from the village of Mammoth, I took a bus to Devils Postpile National Monument trailhead. The entire hike is only 1 mile but I added other interesting stops a little further down the trail. When I arrived at the Postpile, I was as impressed with it as I’d hoped. This rare geological wonder is not to be missed. It’s columns stretch 60 feet high and a foot path allowed me to walk to the top to see the hexagonal pattern of unusual symmetry. It looked like a professional craftsman shaped the columns. It’s hard to believe they were made by nature. I walked down the other side of the columns and I was awestruck that on this side they jetted out from the cliff sideways. Even with a detailed explanation of how it happened, I still feel like it’s a wonder that I don’t understand. 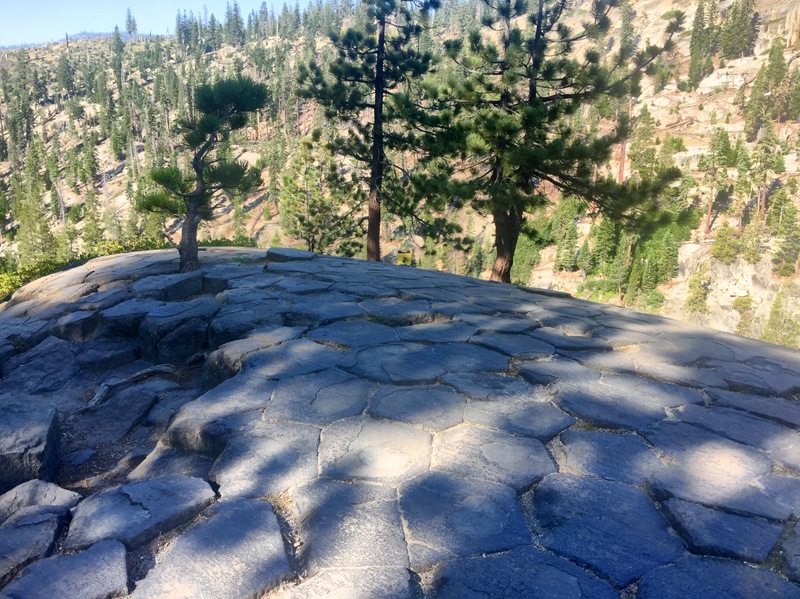 Seeing it for myself helps but I’m still amazed at Devils Postpile. This entry was posted in California, California Getaways, California Outdoors and tagged bucket list, California, Hiking, Mammoth, nature by lesleycarter. Bookmark the permalink. If you love unexplainable geological features then I suggest you visit the Moeraki boulders if you ever make it to New Zealand. The spheres appear out of the dune cliff then ‘march’ across the beach until they disintegrate in the waves. I’ve seen photos and it’s on my list. Seems magical. Great suggestion. This is so cool! I love how nature can just throw the most bizarre and fascinating things at us. It’s such an intriguing world. Me too. That’s one of the most amazing parts. It’s so shocking. Do you have a favorite bizarre natural place? Looks really great and mother nature at it’s finest! All of Mammoth area was so naturally beautiful. I can’t wait to go back and explore it in winter as well. I bet it will be beautiful then, also. My mom recently visited a similar place in Iceland. I haven’t seen photos of a similar place in Iceland. Did you share any on your blog? Another really cool site to see! I’ll have to add this to my list of places to try and get out to visit. Have you been to California before? Where are you from? I have only been to Southern California, Anaheim (Disney Land), Huntington Beach (to watch the AVP Finals in 2014), Newport Beach, Laguna Beach, and Carlsbad (Legoland). Looks like a great place to go and see. I imagine the photos don’t do it the justice it deserves. Sadly, no. I’m not the best photographer either but it really is a place you need to see with your own eyes. 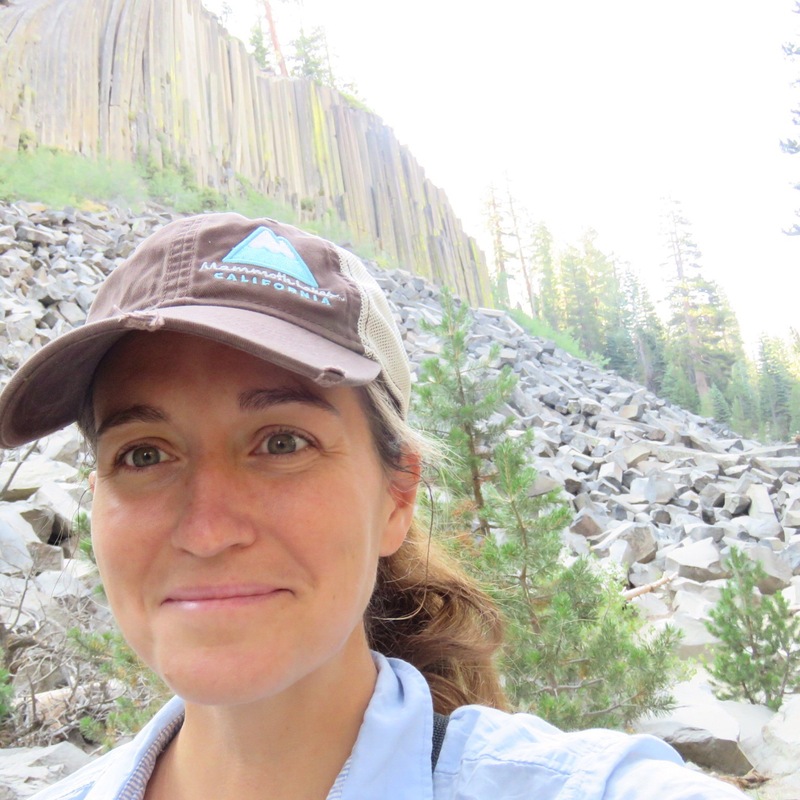 We met up with a bunch of people hiking the John Muir Trail and the PCT. That must have been an amazing experience. When did you hike it? WOW!!! I found a formation like this on a ride in Mt Rainier but NOTHING like this one! Gotta love nature and geology! thanks for sharing and great photos. Was it in piles like this? I haven’t heard of other locations in the US. I’d love to look into it more. The hexagon is a very efficient nesting mechanism that appears often in nature. Everything seeks the lowest possible energy state. No wasted space. It can be seen when ground freezes, basically what happened when the basalt at Postpile cooled. I didn’t realize it was so popular. Have you seen other examples? 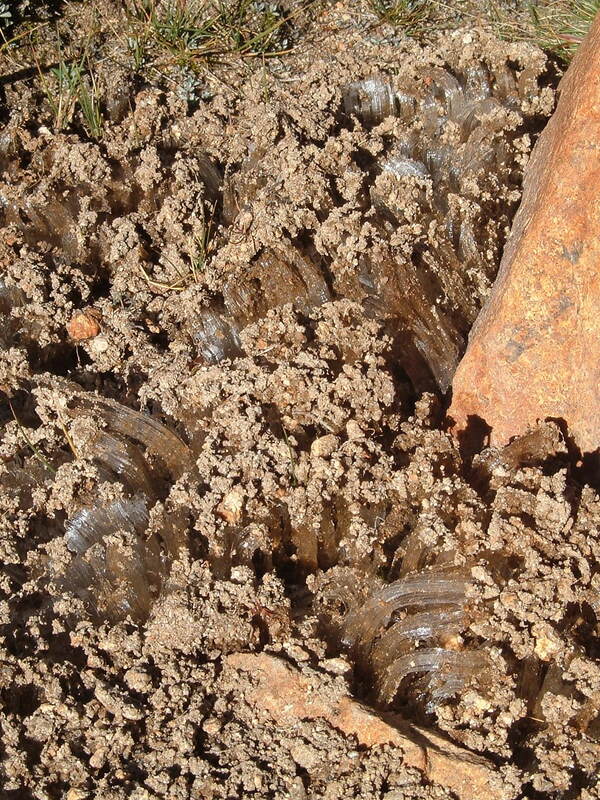 Above is “frost heaving” of stones in tundra. Many of the best examples have to do with ice. Above are some “ice postpiles” I photographed on the west side of Mt. Whitney. The regularity of the hexagons depends on the crystallization time. WOW ! Fascinating. Fantastic place to visit. A great stop I need to make at some point! No excuse when I live in California! Which part of the state do you live? I’m in OC. Proof that nature is both the greatest inventor, and the greatest artist.